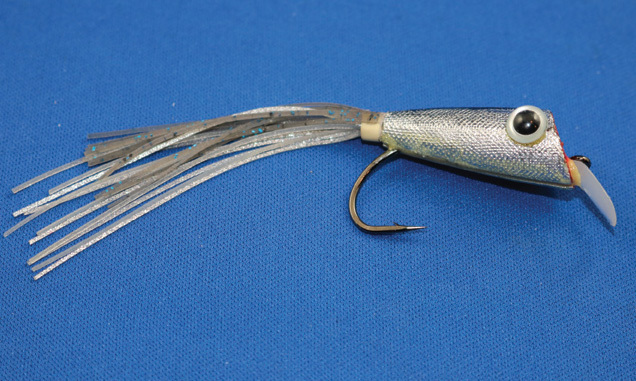 This new fly is just the ticket for catching bigmouthed hawgs. Hook: Gamakatsu B10 S Stinger, size 2 or 2/0. Body: Wapsi Perfect Popper hard saltwater body, size 2 or 2/0. Body foil: Nashua Aluminum Multi-Purpose Foil Tape. Eyes: Plastic eyes with stems. Tail: Sili Legs and a spinnerbait skirt collar. More stuff: Permanent markers, jig paint, epoxy jig finish, five-minute epoxy, and superglue. My topwater fly landed on the far side of a brush pile with a splat. Oscar, my guide, repeated, “Big-fish spot.” He’d already said that half a dozen times that afternoon, and he was never wrong. Two quick pops, and my Crankbug climbed up and over a branch, sliding back into the water. With a short tug on the line, my fly dipped under the surface and waggled from side to side before rising again, sending out a cascade of concentric rings. “He’s looking, he’s looking,” Oscar cried out as a large form passed under the fly. I tugged on the popper one more time; then all hell broke loose. 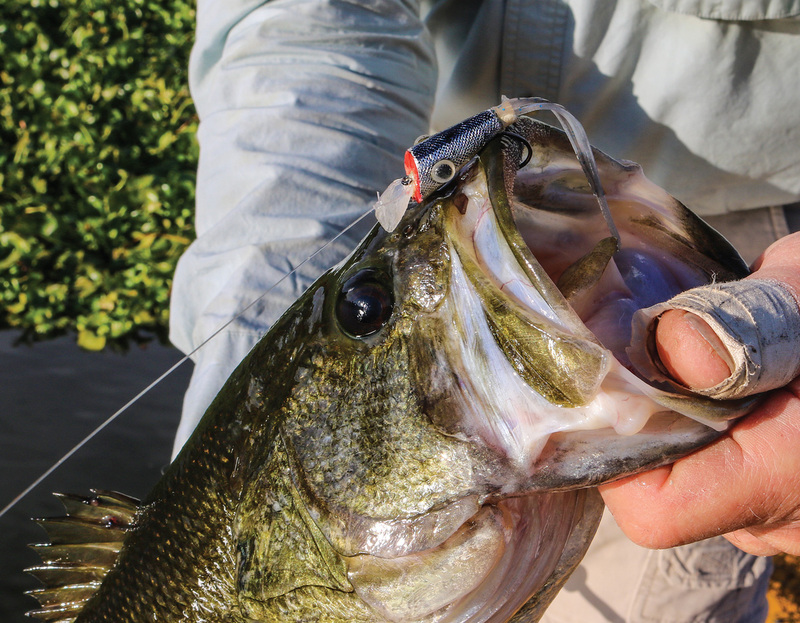 Even before all the water droplets from the explosive strike had returned to the surface, the monster bass was racing for deep water, straining my 20-pound tippet to the max. After five minutes and several trips in and out of a brush pile, the lunker bass finally ran out of steam and slid into the net. The scale read 10 pounds 12 ounces, a true trophy fish. After fishing for only three hours, this was my fifth bass weighing more than five pounds, and my guide exclaimed, “Your fly is working very well today, señor!” That was an understatement if I ever heard one. I caught those remarkable bass using a topwater pattern called the Crankbug. Several very large fish only batted at traditional poppers the previous evening, so this day I wanted to try something a little different, and it worked. Make a few Crankbugs and try them out. 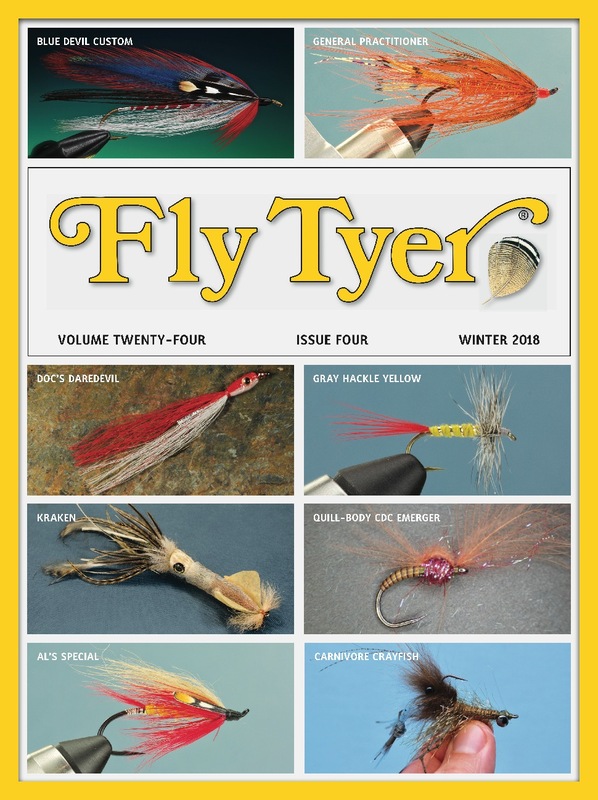 It is amazing to fish a fly that can imitate multiple baitfish and works well in heavy cover. Craig Riendeau is a regular contributor to this magazine. In addition to designing original flies, he is also an expert guide. Craig lives in Georgia, but you can reach him through his website, www.offthedeepedge.com.